I have a confession. I don't use coupons anymore. Ok well I use some, and if I see some good deals at the drugstore I'll jump on them but really for groceries, I'm lucky to remember my list much less my coupons. I haven't used coupons since I was pregnant with baby #4 in my 1st trimester when I was constantly sick, and it was a miracle to get out of the house to even shop much less put effort into it. I did do the whole extreme couponing thing but I didn't have the time anymore. So I went on the hunt for cheap meals for large families because I am feeding a family on a budget! The first thing I did was read this book from America's Cheapest Family, Cut Your Grocery Bill in Half with America's Cheapest Family: Includes So Many Innovative Strategies You Won't Have to Cut Coupons. I started implementing different tactics and started asking other ‘large families' and here is what I do. 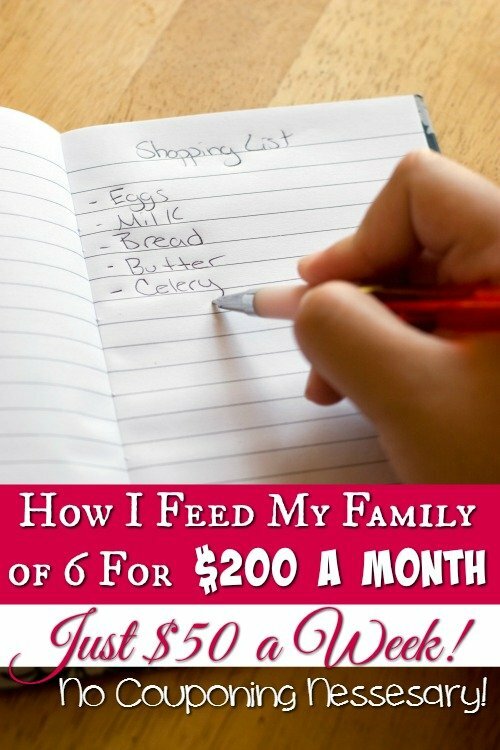 How am I feeding a family on a budget with 6 people for under $200 a month without that crazy extreme couponing? I have developed a system that works perfectly for our family. Here are my steps incorporate what will work for you and watch your grocery budget shrink! Take a tally of what is in your fridge, freezer, and pantry. I make a list, so I have it as I sit down to make my list and menu plan. No need to buy ketchup if you already have a bottle in the pantry. Menu plan around what you have in your pantry already. This doesn't have to be strict but a list of dinners for the week/month. I only plan dinners, but you can do breakfast and lunch to whatever works for you. We plan for an entire month at a time. If you struggle with menu planning and finding cheap meals for large families I HIGHLY recommend the $5 Dinners Menu Planning when feeding a family on a budget. The meal on this menu plan cost $5 a meal. We have one meatless dinner a week. We include meals like homemade Mac and Cheese, Bean Tacos, Spaghetti, Fettuccine Alfredo, homemade pizza, pizza sandwich, rice and beans, and more. Add beans to stretch your meals! We love beans. Mix them in taco meat, burgers and more to stretch your meat. We have breakfast for dinner once a week. Pancakes, french toast, waffles, omelets, blueberry cupcake bites, and more are all cheap, and the kids love it! Find more easy breakfast recipes here on The Frugal Navy Wife and make sure to check out our 40 breakfast for dinner ideas. Use up your leftovers. We have a leftovers night once a week. Use up the leftovers and make a few sides to go with them. Use this and the tips above and you have almost half your week of menu planning done. Leftovers are great for lunches as well. Take a lunch to work or if you stay home, this works too. You can make sandwiches for lunch for the week, and freeze them. Then all you have to do it pull out the sandwiches for the day and go. You can also make bacon and put it in the fridge and make BLTs, Think outside the box! I also try to make breakfast for the week, so it's grab and go. I make things like bread and muffins. You can make pancakes and waffles and freeze them between wax paper. You can set aside baggies, pre-portioned, ready to be made. We go grocery shopping once a month. I do a month long menu plan, and we grab everything we need. We have a deep freezer and a stand-up freezer to allow us to do this. All we just have to grab produce and more milk mid-month. We freeze our milk so we can buy in bulk. The logic behind this is it also limits the amount of impulse spending. Don't go for the convenience foods, make it yourself to save money. Pizza crust, garlic bread, rolls, flavored rice, pasta sauce, jams, apple sauce. These can all be made yourself and save money doing so! Pizza crust can be made in bulk and frozen. We make a huge batch of pasta sauce and use it on pizza as well. Each fall we make jams and applesauce for the year and can them as well. See the 7 items we stopped buying and started making to save money. Have freezer meals ready for the days you would normally grab fast food. We always have 3 or 4 different meals in the freezer for those busy days where we would normally grab food out. These are ready to pop in the oven and go. Freezer food doesn't have to be casseroles! Chicken can be frozen in marinades just add sides and go! I have gotten most of my freezer recipes from the Don't Panic – Dinner's in the Freezer: Great-Tasting Meals You Can Make Ahead cookbook. Using the slow cooker allows you to buy cheaper cuts of meat, you cook them all day in the slow cooker, and they come out so tender! The Slow Cooker also allows you to put a meal in, in the morning and come home from work to a cooked meal. One of my favorite cookbooks for slow cooker meals is Taste of Home Slow Cooker: 431 Hot & Hearty Classics . **Bonus** In the summer a slow cooker helps you save money by not having to heat up your oven and then having your AC having to work harder to cool off your house! With our size family, we buy certain things in bulk. Rice, flour, sugar, tomato products to make a sauce, diapers and wipes. It's also cheaper to get certain things at BJs (we use BJs because they are closest, and they take coupons!) then at the regular store. Chicken is always at my stock price here, and cakes are cheaper. My sons carnation milk mix he needs for his weight gain problem are MUCH more reasonable here. Tip: We got our BJs memberhip on Groupon and got some great bonuses and coupons. Watch for sales and stock up. We stock up on meats when they are on sale. We score chicken drumsticks for 49¢ a pound, Chicken Leg Quarters for 59¢ a pound, boneless skinless chicken for $1.77 a pound. We grab a few turkeys around Thanksgiving, hams at Easter, etc. We use a lot of chicken in our cooking. But we only buy boneless skinless chicken breast at $1.99/lb for 1 out of 5 meals if that. We buy chicken leg quarters for 59¢ a pound, cook them, pull the meat off and use them in our recipes. See how we got 16 meals for $25 this way, this is my best-kept secret for getting cheap meals for large families. Watch for manager marks downs on meat. These are meats that are approaching their sell-by date. If you freeze this stuff right away, you are fine to stock up on it. They just want to clear it out before the sell by date. I shared a few ways to save money on meat. I also use Zaycon to get deals on meat that I can't find in the store. We start each of our once a month trips at a grocery outlet. Near us we have and Grocery Outlet and then about 20 minutes from us we have a Sharp Shopper. We usually shop at the Sharp Shopper (we find it a tad bit cheaper) and we will start our grocery trips there because the stock changes all the time. The outlets usually get things that are close to being out of date, or they'll get seasonal stuff that is out of season, they will also get overstock from the local grocery stores. You have to watch the expiration date but you can score some great stuff, and a lot of it is name brand. We get our eggs here, they're fresh local eggs, and they are cheaper than at the grocery store. Once we are done at the outlet store, we will shop at Aldi, then we go to BJs (mostly for diapers and wipes!) and then hit our local grocery store to get anything else that we weren't able to get. We always watch the sales paper and pick up sales items even if we have to stop at a separate store. We will watch sales papers all month, mostly for meat deals to stock up on. I LOVE finding the meal deals, where I buy one items in a meal and get 2-3 others free. I can use coupons on it all and this is the one of the best cheap meals for large families! We picked our main grocery store that we shop at because it offers points back towards free groceries that helps cut back on our grocery budget. Many will offer something off your bill or gas, pick a store that is decently priced, takes coupons, possibly doubles coupons and offers a rewards program of some kind. I do use Ibotta, Checkout 51, Shopmium (use code GMUECGRX at sign up) Snap by Groupon, and Jingit because I can just upload my receipt and go. I have 7 days from the time I shop to upload, and I can combine rebates from all 4 sites from 1 receipt to maximize savings! I'll also use Receipt Hog (use code 9qms930n) and ReceiptPal to get points for my receipts (you earn by uploading any receipt to the app) to use for gift cards. I also use Saving Star because I can just go in once a month load on my coupons and go It will track my grocery cards and load my rebates for me. I use Amazon Pantry to save money on groceries. I watch their coupons and sales in the pantry department. I use this to help stock up on bulk items too, along with household items, diapers wipes, cleaning supplies, toilet paper and more. I use the 45 places I get free Amazon gift cards from to help get these items for free. When feeding a family on a budget the bet thing you can do is get free groceries. I make it a point to earn $100 in free groceries a month. I also earn about $200 a month in Amazon Gift Cards for free to use when I order from Amazon Prime. 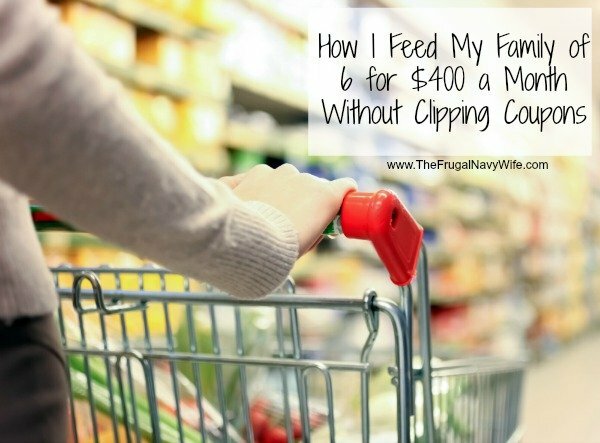 Don't forget to Save Money on Produce find more easy meals here on The Frugal Navy Wife. What ways are you feeding a family on a budget and cheap meals for large families? I used to be an avid couponer, but eased off a lot when life changed and it became harder to do and less worth it. Instead I did what you have done a lot of what you have, especially after getting a ‘smart’ phone this past year. Now I just need to learn to stick to the list and not overbuy when I go to the grocery outlet near us. Great job. Keep up the good work on making your money go further. I really appreciate a lot of these tips and while some of them are not practical for us, quite a few are and I will be implementing them on my next trip to the grocery store. Thanks so much for this. Every family is different. I’m glad you found some tips that will work for you. I am curious what your daily meals are for the month. I am trying to pull my own meal plan together and if you’ve already mastered $200 per month I’d like to see how to help simplify my own planning.